Many of the avenues older apartment buildings, and hotels, were designed with deep "wells," or "courts," to provide more "light and air," but such designs often were a bit dreary. This building, however, is an exception as its light-colored facades and nice detailing give it considerable elegance. The major "well" here is over the entrance and large lobby and because of the very handsome protruding window bays, the building seems to be like sentries standing at attention. The 12-story apartment building was erected in 1909 and converted to a cooperative in 1957. It has 48 apartments and was designed by Pickering & Walker. 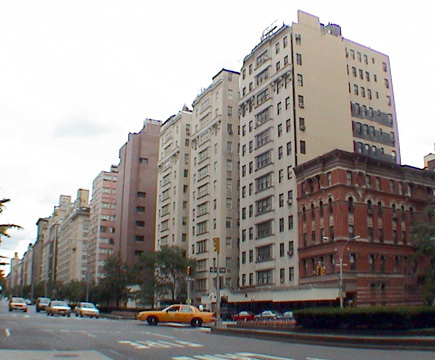 The building is across 76th Street from Lenox Hill Hospital, but fortunately that institutions "pink" pavilion and major entrance are on 77th Street as is the busy local subway station on Lexington Avenue. The neighborhood here is very attractive with many charming restaurants and important art galleries nearby along Madison Avenue. This building has an exposed rooftop watertank, a canopied entrance, a doorman, and a concierge but no sidewalk landscaping, no balconies, no garage and no health club.